Contest is open to legal United States residents, residing in the United States, eighteen years of age or older. Employees of MRS. T’S® PIEROGIES and members of their immediate families, MRS. T’S® PIEROGIES’s parent, subsidiaries, affiliates and their advertising, promotion and production agencies are not eligible to enter. Entry into this contest constitutes acceptance of these Official Rules. 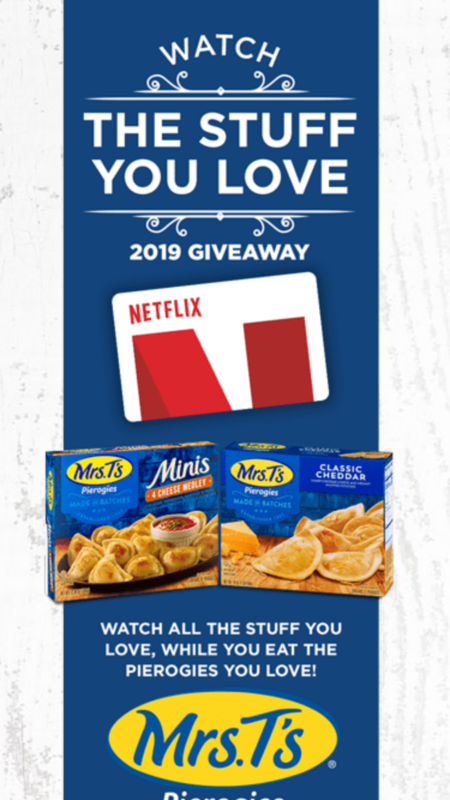 How to enter: To enter, participants must enter at http://www.mrstspierogies.com/stuff-you-love-giveaway between February 8, 2019 and March 8, 2019. There is a maximum of one entry per participant, per day. Submit your entry by visiting http://www.mrstspierogies.com/stuff-you-love-giveaway and entering your name, phone number, and email address to win. All entries will be deemed made by the authorized account holder of the email address submitted at time of entry. Limit one winner per household or address. All winners will receive a call or an email message from MRS. T’S® PIEROGIES requesting additional information. If a potential winner fails to respond within 30 days, or fails to provide MRS. T’S® PIEROGIES with the requested information within 30 days, or is determined that the winner is not eligible to win, the prize will be forfeited and that prize will not be awarded. MRS. T’S® PIEROGIES is not responsible for entries that may be lost, late, delayed or misdirected, damaged, illegible, or incorrect. Entries will not be acknowledged or returned. Electronic entries that are incomplete, incorrect, illegible and/or deemed not eligible by MRS. T’S® PIEROGIES will be automatically disqualified MRS. T’S® PIEROGIES is not responsible for incorrect data, electronic, network, computer or other technical malfunctions that may occur upon collection, processing and transmission of data, nor for any type of graphical or other error in the administration of the promotion. In case of dispute as to the identity of any online entrant, the entry will be declared made by the registered name and address on such entry. Each potential winner will be requested to provide MRS. T’S® PIEROGIES with proof that such person is the winner. Any other attempted form of entry is prohibited; no automatic, programmed; robotic or similar means of entry are permitted. CAUTION: ANY ATTEMPT BY AN ENTRANT TO DELIBERATELY DAMAGE ANY WEBSITE OR UNDERMINE THE LEGITIMATE OPERATION OF THE PROMOTION MAY BE A VIOLATION OF CRIMINAL AND CIVIL LAWS AND SHOULD SUCH AN ATTEMPT BE MADE, MRS. T’S® PIEROGIES RESERVES THE RIGHT TO SEEK DAMAGES FROM ANY SUCH PERSON TO THE FULLEST EXTENT PERMITTED BY LAW. A total of nineteen (19) Prize Winners will win from those meeting the criteria established under the contest rules between the dates of February 8, 2019 and March 8, 2019. The decisions of MRS. T’S® PIEROGIES with respect to the winners in regard to all matters relating to this promotion, shall be final. Winners will be selected at random. Odds of winning depend on the number of eligible entries received for the promotion. By entering the contest, entrants fully and unconditionally agree to be bound by these rules and the decisions of the judges appointed by MRS. T’S® PIEROGIES, which will be final and binding in all matters relating to the contest. Winners will be contacted via the provided email address and also announced via their first name and last initial on the MRS. T’S® PIEROGIES Facebook page. By entering this contest, entrants also agree to have their first name and last initial published on the MRS. T’S® PIEROGIES Facebook page and http://www.mrstspierogies.com/stuff-you-love-giveaway. There will be no prize substitutions in lieu of prizes other than that described in the contest rules. Winners will be solely responsible for any and all applicable federal, state, and local taxes and gratuities. MRS. T’S® PIEROGIES is not responsible for winner limitations that prevent acceptance or use of any prize. MRS. T’S® PIEROGIES may rescind, cancel or revoke this contest without liability at MRS. T’S® PIEROGIES sole discretion. All entries become the property of MRS. T’S® PIEROGIES Winners agree that, MRS. T’S® PIEROGIES, its affiliates, subsidiaries, advertising and promotion agencies and employees (the “Released Parties”) shall have no liability in connection with acceptance or use of the prizes offered. By accepting these prizes, winners agree to hold harmless the Released Parties for any injuries, damages or losses that may be sustained in connection with the ownership, use or misuse of any prize. Acceptance of any prize shall constitute and signify the winner’s agreement and consent that MRS. T’S® PIEROGIES may in perpetuity use the winner’s name, likeness, and/or prize information for promotional purposes without further payment or consideration. 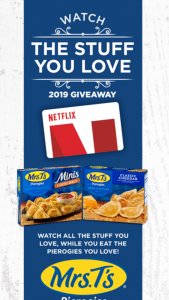 For a list of winners, send a self-addressed, stamped envelope to: MRS. T’S® PIEROGIES “Watch & Eat the Stuff You Love 2019 Giveaway – Winners’ List”, c/o Allebach Communications, Marketing Department, 117 N. Main St., Souderton, PA, 18964. Requests must be received by April 8th, 2019. By entering this contest, I hereby certify to MRS. T’S® PIEROGIES that I am eligible to participate in the above – mentioned contest. In consideration for value received, receipt being hereby acknowledged, and intending to be legally bound, I give MRS. T’S® PIEROGIES or its advertising/media agents, right and permission to use my name and address in advertising and other promotional matters, as MRS. T’S® PIEROGIES so desires, with no further compensation to me, cash or otherwise, I certify that neither I, nor any immediate member of my family or household is an employee of MRS. T’S® PIEROGIES, subsidiaries, affiliates or their advertising, promotion or production agencies. I certify that I am 18 years of age or older, have read and followed the rules of the contest, and know of no reason why I should not be designated as a winner and receive the prize involved. As stated in the contest rules, I understand that all federal, state, and local taxes on the value of the prize, which I accept, is solely my responsibility as the prize winner. I also understand that MRS. T’S® PIEROGIES will issue an IRS Form 1099 (for all prizes exceeding $600.00) indicating the fair market value of the prize to me and to the federal government for tax reporting purposes. I, for myself and my successors and assigns, do hereby release MRS. T’S® PIEROGIES, its affiliated companies, employees, officers, directors, shareholders, agents, and their advertising/media agencies or affiliates, from any and all actions, causes of action, suits, damages, judgments, claims or demands whatsoever, in law or in equity, including but not limited to, claims of personal injury or wrongful death which I, successors and assigns now has or hereafter can, shall or may have for, upon or by reason of any matter, cause or thing whatsoever to the extent permitted by law. There will be no prize substitutions or transfers. No purchase necessary to win. In case of a dispute, the decision of the judges is final. If any statement made by me in this affidavit is false, I agree to return immediately upon demand by MRS. T’S® PIEROGIES, the value of said prize, which has been or may be awarded to me. General Conditions: Promotion may be withdrawn without prior notice. MRS. T’S® PIEROGIES is not responsible for lost, late, incomplete, damaged, inaccurate, stolen, delayed, misdirected, or undelivered entries or comments, incorrect, changed or non-functioning Facebook accounts; or for lost, interrupted or unavailable network, server, Internet Service Provider (ISP), website, or other connections, availability or accessibility or miscommunications or failed computer, satellite, printer errors, telephone or cable transmissions, lines, or technical failure or jumbled, scrambled, delayed, or misdirected transmissions or computer errors of any kind whether human, mechanical, electronic, typographical, printing or otherwise relating to or in connection with the Promotion, including, without limitation, errors which may occur in connection with the administration of the Promotion, the processing of entry requests, likes, or comments, or in any Promotion-related materials. MRS. T’S® PIEROGIES not responsible for injury or damage to participants’ or to any other person’s computer or printer related to or resulting from participating in this Promotion or downloading materials from or use of the website. Persons who tamper with or abuse any aspect of the Promotion, as solely determined by Sponsor, will be disqualified. Should any portion of the Promotion be, in Sponsor’ sole opinion, compromised by bugs, virus, worms, non-authorized human intervention or other causes, which, in the sole opinion of Sponsor, corrupt or impair the administration, security, fairness or submission of information, Sponsor reserves the right at its sole discretion to terminate the Promotion and, if terminated, at its discretion, select the potential prize recipients from all eligible, non-suspect entries/comments received prior to action taken. By participating, you agree (i) to be bound by these Official Rules and the decisions of Sponsor which are final and binding, and (ii) to release and hold harmless the Sponsor, their subsidiaries, affiliates, retailers, and advertising and promotion agencies and all of their respective officers, directors, shareholders, employees and agents against any liability, for any injuries, losses or damages of any kind, including death, to persons, or property resulting in whole or in part, directly or indirectly, from participation in this Promotion or acceptance and use of a prize. Sponsored by MRS. T’S® PIEROGIES and Address. This Promotion is in no way sponsored, endorsed or administered by, or associated with, Facebook or Netflix. You understand that you are providing your information to Sponsor and not to Facebook or Netflix.